2. An action that, though technically plausible, is inadvisable for ethical reasons. Strange, no? Let me explain this in more 13-year-old terms for you. You see, cloning a mammoth is possible (if not for the animal being extinct, but we will overlook this for the time being until you finish reading this paragraph and I can explain it to you). 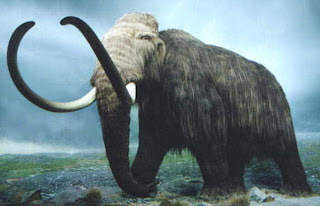 Okay, now that you have a mammoth in your brain, take said mammoth and multiply it. Multiply it until there are as many mammoths as there are squirrels. Now imagine these squirrel-mammoths. Would this be good? no. That is precisely why this allusive euphemism was created. This year, a group of scientists tried to resurrect a woolly mammoth. This was proven to work after they cloned a mouse that had been in deep freeze for 16 years. So in January, Akuri Iritani of Japan's Kyoto University said he could do so by 2016. However, many people were all up in his grill, so I don't know if he'll continue. I like Jurassic Park, so... I would like some mammoths please Mr. Iritani? Thanks, man! P.S. Happy End of the Year, H.A.G.S. and DFTBA! I have to say, I love fred and the playlist! !